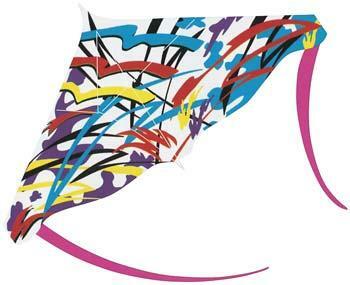 This is the Hyper Sport Stunt Kite from Gayla®. Suitable for Ages 8 & Older. Retail $6.49 SAVE 20% ! Made of high quality rip stop nylon Colorful panels durably stitched together Durable rods Dual Control Stunt Action. Double or single line flying 4'wingspan Action sport flying Fast turns, spirals and power dives 30 feet of tail material 200 feet of twine.